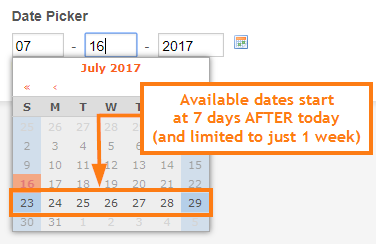 Would you like to set limits on your Date Picker Field? Example, you only want to allow your users to enter dates that fall on a weekend. That is now possible with the new advanced options added to the default Date Picker Field. First, add the DATE PICKER field to your form then click the GEAR icon. In the properties section, go to the LIMITS tab. 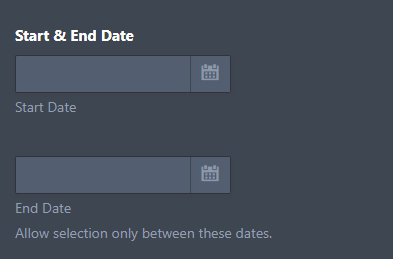 Check the PAST option if you want to allow users to select past dates, same goes with the FUTURE option, check it if you want to allow future dates to be selected. Unchecking a day will disable all of the same days in the calendar. 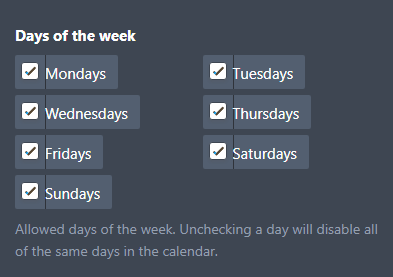 You can uncheck which day of the week you don’t want your users to select in the date field. So, to only allow weekdays, uncheck Saturday and Sunday. Disable dates within the range you set up. This will only allow selection between the dates you selected. Here you can disable specific dates. The correct format is YYYY-MM-DD but you may also use MM-DD or just DD. This is similar to the "Start & End Date", but this allows you to set multiple date ranges to disable. This is also a good way to filter out invalid dates. Example, I would like to force users not to enter invalid years like "192", or years that are way in the past "1900" or "1720". What I did is set the date range like this: 0000-01-01>2000-01-01 so users can only select dates from 2000-01-01 onward. You can also use Dynamic Date Selections. You can achieve this by utilizing the Start & End Date limit and use today+x (where x is the number of days to be added to today). Say, you're working on a booking form and would like to limit the booking dates to be at least 1 week after submission, and at the same time, you want to limit the booking window for just 1 week. For this to happen, you need to set the Start Date to today+7 (1 week after) and the End Date to today+13 (a window of just 1 week). i am using a form for hours worked the last week. So an employee may be in the app any day. can i set up an algorithm so that I can set the date to the previous friday regardless of when the employee is using the app? Is there a way to eliminate Saturdays and Sundays from this calendar completely? I want to set a time set that the customer cannot book until 3 days out, however Saturdays and Sundays are not included in that 3 days. i.e. If a form is submitted on a Friday, then the earliest they can get it is Tuesday or Wednesday. I am having trouble with the the Dynamic Date. When I put in 'today + x' into either fields, it sets the date to January "x", 2001 for that field. ie. in my form, I put "today + 2" in the Start Date field, and the date set itself to 2001-02-01. 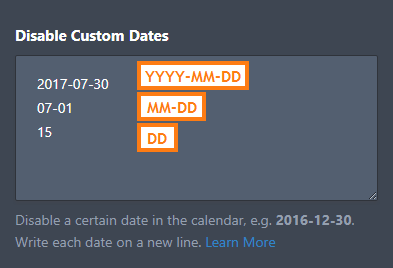 I'm having trouble with the Dynamic Date selection. I tried today + 2, Today + 2, today+2... I'm still able to select a date earlier than two days from now. Please help. Is the option Today+x still working? I am testing it and I am still able to pick before two days. A mi me gustaria poder tener la opción de yo en el calendario, marcar días aleatorios en los que se realizará la actividad, y que las persones marque en que dia realizaran la actividad. Is there a way to disable a certain time on a reoccurring day of the week? Is there a way for a customer to select multiple dates e.g. for recurring events? I am having trouble getting the date requested correct. I've used Today+2 in the start date field. For an order, we only want the date requested to be two business days after today. I've disabled the Saturday and Sunday date lines and disabled certain holiday dates. Not sure what I am doing incorrect for the Today+2. Can you please review? I switched from google forms just so I could have better control over the calendar. The capabilities, and ability to restrict dates, on this date picker are amazing. How can I disable today's date? We want to restrict the number of persons that can select a date. 2.) how can change the date time on the email to show dd mm yy im getting mm dd yy. how can I ensure that the end date has to be after the start date? Currently the end date can be earlier than the start date. I dont want an enquiry that is needed any date after 30 days from today. How do I disable after-30-days selection? how can I limit the date picker, so that only the last day of each month can be chosen? I have set the date so that they can only select a Tuesday but I only want them to select the Tuesday of the next/current week. (I.e. so that they can only select this Tuesday and not one in the future. How do I achieve that?. Is there away I can set a limit on the amount of times a day is picked? Is there a option that every date can be chosen only once. So after a speaker is fixed for a specific day, the date cannot be entered anymore? How can i restrict time to working hours only? I'm trying to create a sign-up form and post the link but not have it active until a specific date. Post it today (8/22) but not have the form "live" until September 1, for example. I'm wondering what options there are in the 'Dynamic Date Selections' this article talks about. Does it only support combinations with 'today'? I'm looking to exclude wednesdays in even weeks, and thursdays in uneven weeks. Peut-on limiter les créneaux horaires svp? Si cela est possible, comment faire? In the settings you can disable the past dates, but is it possible to disable the present day for the second user who's filling in the form today? So, user 1 that fills in the form today can choose today and send in the form. User 2 that fills in the form today can select a day starting by tomorrow. Thanks already for your answer. Start & end date doesn't work. I put in 1/1/1985 - 12/31/2006. When I use the form ANY date I enter is accepted. Why?? My data selector limits to only Saturdays, aka "Week Ending Date". How can I limit to the previous 4 'week ending dates' and future week ending dates? For example, if today is 5/15/17, I would expect possible data selections to be 4/22/17, 4/29/17, 5/6/17, 5/13/17, and all future week ending dates (5/20/17, 5/27/17, etc). In this example, user would not be able to select 4/15/17, 4/8/17, and prior. I need the date picker only to allow dates that are 3 business days in the future. As it is now, if someone submits an order on a Friday, the DatePicker allows them to choose Monday, when it should be Wednesday. I need the DatePicker to skip over the weekend when counting 3 days. Is this possible? Is it possible to limit to weekdays only? I disabled weekends, but I need the form to only allow them to choose a date that is 3 days from today. This works out great, except if they choose a Thursday, it lets them choose Monday. I'm thrilled to have this as an option so thanks for that! My disable date are not working. For example, I would disable today+9>today. How can i do that? I will be limiting date entry to at least 21 years ago, correct? I'm trying to ensure that applicants are at least 21 years old. Hi, I have been trying to restrict booked dates on my form so that only available dates can be selected, Unfortunately, neither of limit dates option on date picker property seems to work. Is there a global issue? its not working on preview also. I am using Chrom browser. I'd like to be able to disable every OTHER Thursday from a start date. I know I can compile a list of those dates manually, but is there an easier way? hi, from yesterday my Disable Date Ranges is not working for me. i use this code "today>today+1" to remove the tomorrow selection. Hi, if i have 2 fields ('Departure Date' and Return Date), is there a way of limiting it so that only dates on the same date or after can be selected in Return Dates? So you'd effectively be setting a disable dates before 'Departure Date'? Hi, I wanted to restrict my form so that only the next 7 days can be chosen and all future dates after that disabled. Is this possible? Hi, I have been trying to restrict my form so that only weekdays can be selected, in addition to dates which are more than 2 weeks in the future. Unfortunately, neither of these seem to work. Is this a global issue or am I the only one experiencing this issue? Thank you for this improvement. 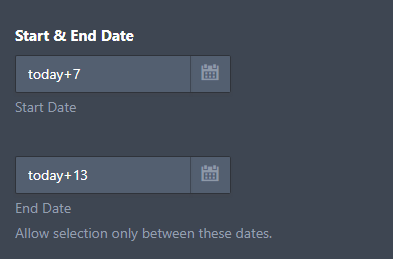 I would like to be able to limit date selection to "today+6" ... in other words, users can't select a date until it is 6 days from the current day. I can do this in the form validation, but I can't seem to do it in the datetime limit functionality. How do I make this line of my form changeable. I need to be able to put date and time of when I would like the request to be completed. 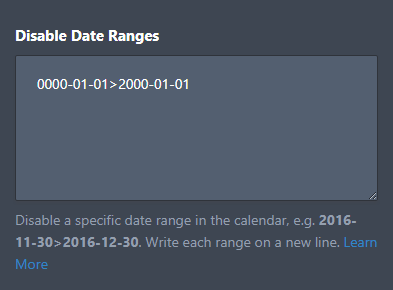 Calendar Report: Date Range possible?